INDIANAPOLIS & FORT WAYNE, INDIANA, January 18, 2018	(Newswire.com) - ​​Jack Laurie Group (JLG), Indiana’s largest commercial flooring and interiors contractor, has partnered with Associated Builders and Contractors, Inc. (ABC) to offer the nation’s only merit shop floor covering apprenticeship program. 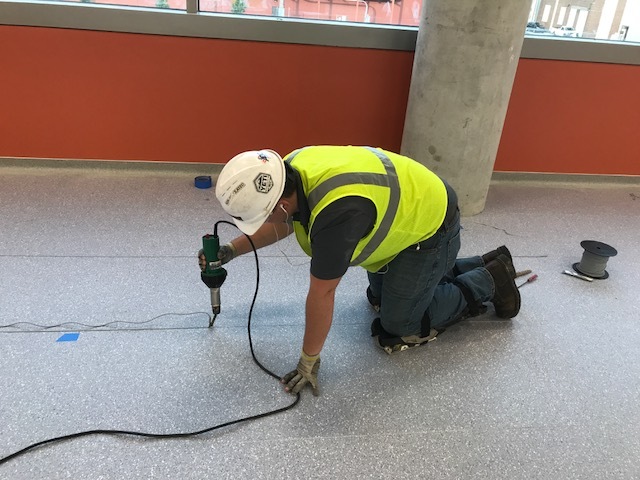 The program was created to boost the talent base of skilled floor covering installers and address the construction industry’s staggering workforce shortage, which began during the Great Recession. With guidance from the Flooring Contractors Association (FCICA), Jack Laurie Group developed a four-year curriculum in floor covering installation that culminates with a graduate’s certification as a trade journeyman. Participants are paid for on-the-job training, and a minimum rate of pay is guaranteed throughout the program. Participants also have opportunity to earn an associate’s degree from Vincennes University completely free of charge, thanks to a grant from the Indiana Department of Workforce Development. The program has been certified by the U.S. Department of Labor (DOL) as an official or “bona fide” apprenticeship. This is the first time the nation’s labor department has approved an apprenticeship program in Indiana created by a private employer. Until now, all DOL-certified programs were offered by trade unions. Indiana is a Right-to-Work state, so nearly 80 percent of the construction work is completed by merit shop employees. Following the 2008 financial crisis and housing debacle, construction-related occupations declined by nearly 1 million or 16 percent overall, according to the U.S. Bureau of Labor Statistics. Many of those who left never returned, even when the industry rebounded, instead pursuing jobs that were considered less cyclical. This led to a critical shortage in skilled workers, particularly in the 25- to 45-year-old age group, and higher wages in the industry. Hardwood flooring installers make an average of $52,477 per year, according to Salary Expert. The average journeyman at Jack Laurie Group also makes north of $50,000 annually, and the minimum starting rate is $18 an hour. The apprenticeship program is the latest addition to JLG’s Jack Laurie University, an in-house employee development program that offers ongoing training and certifications in a variety of services and professions. The apprenticeship includes classroom, lab and field training by JLG’s own National Center for Construction Education & Research (NCCER)-certified instructors. More specifically, requirements include 8,000 on-the-job hours and 576 classroom and lab hours. The program is completely tuition free, but participants must have a high school diploma or GED. Participation in the Vincennes University associate’s degree program is optional. The Indiana/Kentucky chapter of Associated Builders and Contractors will host a graduation ceremony at Lucas Oil Stadium, including dinner for two and a tour of the stadium, for participants who complete the program. Interested candidates are asked to visit http://jacklauriegroup.com/careers/. Click on the ‘register’ tab and fill out the short contact form. Jack Laurie Group (JLG) is Indiana’s largest provider of interior contracting services, including commercial and residential flooring, athletic floors, framing, drywall, paint, ceilings and facilities cleaning services. Locally owned and operated, JLG has offices and showrooms in Fort Wayne and Indianapolis. The company was founded by Jack Laurie in 1950 with nothing more than a tiny rented garage, an old Chesterfield cigarette truck and plenty of gritty determination. We have grown to nearly 300 employees, and our customers include many of the state’s largest employers. The JLG motto is “Making Spaces Better Places to Work and Live.” But beyond that, we’re obsessed with providing customer service like you’ve never seen. We’re so determined to impress you and blow away the competition that we offer the World Famous Puppy Guarantee. If a customer feels like we’ve dropped the ball in any way, we will credit their account for the service AND make a matching donation to Make-A-Wish in their name. If they’re still not happy, we’ll given them a puppy because … well ... it’s a puppy. Associated Builders and Contractors (ABC) is a national trade association that advances and defends the principles of merit-based shops in the construction industry, representing merit shop contractors, subcontractors, material suppliers and related firms in the United States. The Indiana/Kentucky Chapter ranks in the top five in the nation for membership size, and in the top three for education and training. The local chapter has received numerous awards for grassroots initiatives, internal operations, member retention and more.